Ben Morgan brought a blend of England and Wales to the table on Test debut against Scotland in 2012. The No.8 was born in Bristol but moved to Wales to advance his career and played for Merthyr and with Cardiff Blues Under-20s before switching to Llanelli and the Scarlets. Strong performances at club level attracted interest from both England and Wales, and the two nations vied for his international future. In June 2011 Morgan rejected the chance to play for England Saxons in order to keep his options open as he was due to qualify to play for Wales in January 2012. 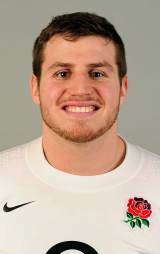 After the turn of the year, Morgan finally pledged his allegiance to England and he was subsequently named in Stuart Lancaster's Elite Player Squad. Morgan took the No.8 jersey from Phil Dowson for the latter stages of the Six Nations and turned in an impressive display to help beat France in Paris. He retained his spot for the summer tour to South Africa but sat out the third Test - replaced by Thomas Waldrom - following criticism of his workrate. Prior to touring he confirmed a move to Gloucester, where he replaced outgoing skipper Luke Narraway.